What is the new packaging change taking effect Sept 1, 2019? Is the Books on Tape website going away? 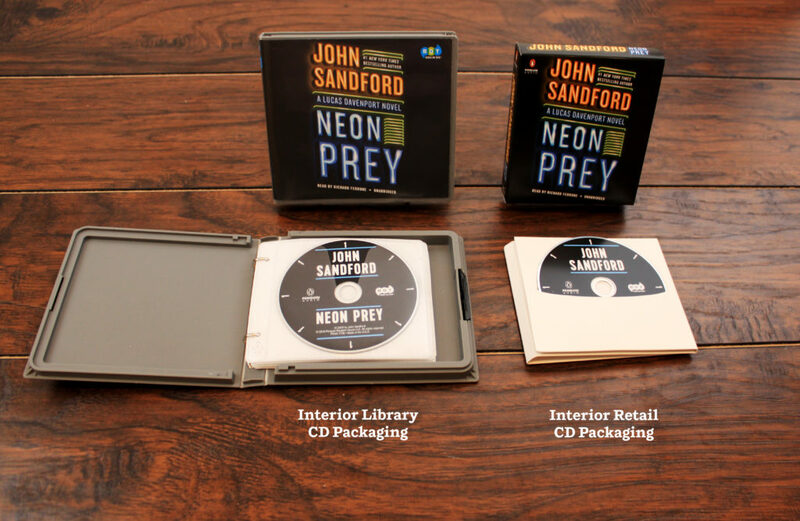 What is the difference between library packaging and retail packaging? Can I still place CD orders on the BOT website? How does BOT serve the library market? I’m a consumer, how do I purchase BOT product? How has the growth in access to digital products affected audiobook listeners? Does BOT offer children’s audiobooks? Can I use audiobooks in my classroom? Can I use audiobooks in my library’s story time or book club? What are my options for receiving backorders? Starting on Sept 1, 2019, we will no longer be publishing CDs in BOT library packaging. However, effective immediately, CDs in standard retail packaging are now available to libraries via booksontape.com. Additionally, in-stock backlist library-packaged CD editions WILL continue to be available on our website. And of course, our entire catalog of Books on Tape and Listening Library titles WILL continue to be published as library audio downloads available via your providers. Click here to read the letter that was sent to accounts to announce this change. No, the BOT website (including our tabs for adult and kids audio, as well as large print) is NOT going away. BOT is here to stay and is as excited as ever to serve the library market and your ever-growing patron base of audiobook listeners. You can always look to booksontape.com for listeners’ advisory ideas, audiobook clips, narrator news, title information, giveaways, and much more. Is there something you would like to see? Please let us know! We love libraries and we love hearing from librarians. Yes! Please continue to place your CD orders on booksontape.com. Our recent packaging change announcement does not affect your ability to place orders via BOT. However, new titles that will be published on CD starting Sept 1, 2019 will now be sold via the BOT website in retail packaging. Please click here to view the difference in packaging. Books on Tape (BOT) is a company you can trust. We pioneered the concept of unabridged audiobooks, and we’re celebrating almost 40 years of offering the greatest variety, the highest quality, and the best service. BOT has been creating partnerships with libraries for over three decades, and together we have provided patrons with a comprehensive selection of titles ranging from Dickens to Obama. We are proud to exclusively have Listening Library as our children’s library imprint. Listening Library is the premier audiobook publisher for children’s and young adult literature. 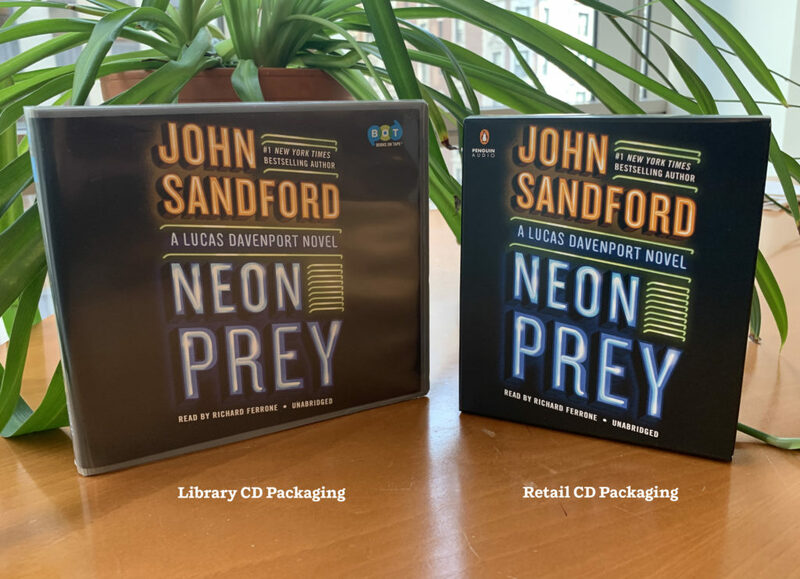 PLEASE NOTE:Starting September 1, 2019, library packaging for CDs will no longer be available from Books on Tape. Any Library Packaged CDs produced prior to September 1 will continue to be available to be ordered. Please click here for more information. I’m a consumer, how to I purchase BOT product? Thank you for visiting the Books on Tape website. If you are not a librarian or educator, please visit www.penguinrandomhouseaudio.com. According to the Audio Publisher’s Association (APA) 2018 survey, there was a 22.7% increase in audiobook revenue in 2017. This continues the six-year audiobook trend of double-digit growth year over year. Audiobook listeners consume books in all formats with 83% of frequent listeners having read a hardcover or paperback in the last 12 months and 79% having read an ebook. Audiobook listeners read or listened to an average of 15 books in the last year, and 57% of listeners agreed or strongly agreed that “audiobooks help you finish more books.” 54% of audiobook listeners are under the age of 45. According to the Audio Publisher’s Association (APA) 2018 survey, smartphone usage continues to grow with 73% of listeners using these devices and an increase in the percentage of listeners using this device most often: 47% in 2018 vs. 29% in 2017 and 22% in 2015. Smart speakers are increasingly impacting the audiobook world with 24% of listeners saying they have listened on a smart speaker and 5% saying they listen most often on a smart speaker. Yes, BOT is the proud publisher of Listening Library audiobooks for the school and library market. Listening Library is the premier publisher of unabridged audiobooks for children and young adults. Their reputation for quality productions of the best in children’s literature has set them apart from other audio producers. Their backlist of over 1000 titles includes such popular characters like Arthur, Ramona, Amber Brown, Harry Potter, and such beloved authors as Judy Blume, Christopher Paolini, Mary Pope Osborne, Stephenie Meyer, Christopher Paul Curtis, and Philip Pullman. Yes! The value of audiobooks as a learning tool in the education of children is widely recognized by experts. Audiobooks bring written text to life, adding an interactive quality that can ignite a child’s imagination. They encourage reading by broadening vocabularies, stretching attention spans, and fostering critical-thinking skills. Listening to audiobooks in the classroom can effectively enrich the reading experience and aid your students in understanding and appreciating literature, history, theatre arts, and more! Learn more about the benefits of audiobooks here. Yes! We have no objection to libraries playing our audiobook titles at live events that take place in the library setting such as “story time” or “book club” events for small groups of children and their parents, so long as admission is not charged and the event is not broadcast, streamed or recorded for broadcast or streaming. My Lists is a versatile tool that allows you to create custom title lists prior to adding them to your cart for checkout. * If your selections and ordering are handled by different departments, use My Lists to create a list of titles. You can then share your list electronically with your technical services team whenever you are ready to order. *Please note: For security purposes, your cart will expire upon exiting the site or after being logged in for 8 hours. To save your titles for future purchases, please use My Lists and move titles into the cart when you are ready to place your order. Every BOT library customer enjoys FREE shipping. All school orders will be charged 6% of the net order value. Orders are shipped via UPS Ground. We will process your order and have it shipped within 3-5 days. UPS will take 7 to 10 days to deliver your order depending on your location. Overnight and 2-day services are available upon request. PLEASE NOTE: Starting September 1, 2019, library packaging for CDs will no longer be available from Books on Tape. Any Library Packaged CDs produced prior to September 1 will continue to be available to be ordered. Please click here for more information. The preferred method is shipment based on on sale dates. This may lead to partial shipments, because on sale dates fall throughout the month. However, complete shipping is available upon request. Should you choose this option your order will be held until every title in the order is available. Complete shipping will not allow libraries to take advantage of our commitment to provide simultaneous release of bestsellers with the hardcover edition. If, for any reason, you are not completely satisfied with your purchase, product is fully returnable within 90 days of the date of receipt for a credit at the price and discount at which the product was purchased. Full copy returns are required for credit. Returns should be mailed, at customer expense, to: Penguin Random House LLC, Attn: Returns Department, 1019 N. State Road 47, Crawfordsville, IN 47933. Return authorization is not required; however, all returns should be made with a claim copy or packing slip indicating for each title the ISBN#, quantity, account name and number, and date of receipt of purchase. PLEASE NOTE: Starting September 1, 2019, BOT will no longer offer replacement CDs for purchase. CD Binders and Inserts will be available for purchase while supplies last. Please click here for more information. If materials are available, replacement orders can be made through our Replacements Order Form. For questions about replacements, please contact customer service. All of our narrators are professionally trained and accomplished performers. Many have received national recognition for their work, such as Grammy® Awards, AudioFile Golden Voice and Earphone Awards, Audie Awards, and have made Library Journal‘s Best Audiobooks list. Most importantly, our productions have our listeners’ stamp of approval. We continually survey our customers to ensure that we are selecting their favorite narrators for forthcoming books. We know that great narration is critical to an enjoyable listening experience! To learn more about our readers, please visit our narrator page. Performers are selected by the individual producers working on each title most often in conjunction with the author. Our producers do not listen to audition tapes sent directly to Penguin Random House, they do however listen to clips and review profiles that are uploaded to the online casting site, AHAB.us. Producers work mostly with New York and Los Angeles based talent agencies, and freelance directors to find the right voices for their projects. For more resources on becoming an audiobook narrator, please visit the Audio Publisher’s Association website at www.audiopub.org for more information.